Sixty-plus years later, "The Ride" has never reached the end of the trail. From 1940 to this new century, "The Ride" has included multiple generations of entire families. The CCWHA has recently published "The Ride" and its trail-blazing history in a well-done coffee-table sized book, thanks to the main sponsorship of the Farmers Co-Op and its stores in Woodbury, Murfreesboro, Eagleville and Smithville. It's taken "four years" for volunteers to complete the publication that can be purchased for $100 at the Woodbury Farmer's Co-Op, located at 400 McMinnville Highway. The Co-Op goes nearly as far back (1945) as that first community-wide ride! Points of interest covered in 66 consecutive years, The (annual Spring) Ride has taken enthusiasts in and around such places as a cave, known as the "Blow Hole," up around Short Mountain, in front of old Parton's Grocery, down Parch Corn Branch to River Road and eventually back to Woodbury. 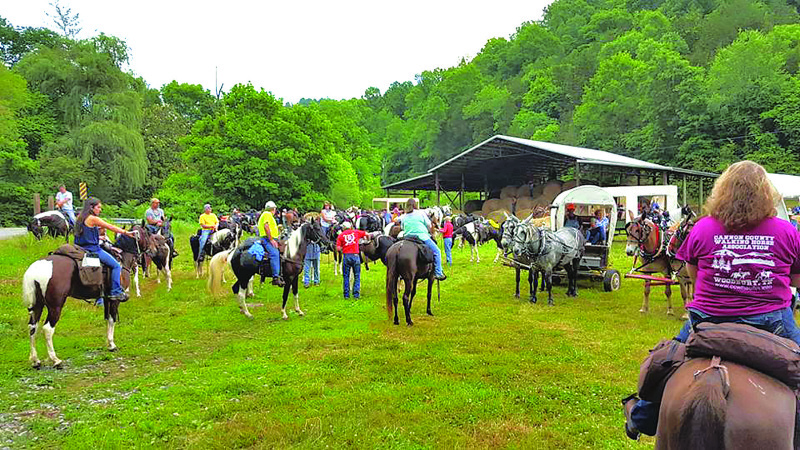 Annals in the historic Cannon Courier confirm the first "Ride" took place on May 30, 1940, when the route included up to Rockhouse to Sugartree Knob, then to Short Mountain where lunch, prepared by the Rideathon Committee, was served at a big spring. After lunch, the group returned to Woodbury down the Stone's River Road. "The Ride was such an overwhelming success with 83 riders participating, that the founders began meeting at the (Cannon County) Courthouse in April, 1941, to plan the second rideathon," the Courier's archives confirm, courtesy of present-day Courier Publisher Ron Fryar. Organizing founders of The Ride reads like the "who's who" of Cannon County history, with such notable names of Chairman Charles Hawkins, vice chair J.H. Cummings, secretary/treasurer Mrs. J.H. Cummings, publicity directors Hayden Smith and Alfred Roach, along with trailblazer R.W. Hawkins. In that era, not everyone owned a steed suitable for trail riding. No problem because a "committee of Alfred Mason, John A. Hendrixson, Dave Curlee, Bob Mitchell, L.D. McCrary, Jim Brandon and M.F. Roach located and hired horses for the event. (steed) Owners were paid $1.50 rental fee for the day of The Ride," the book records. Since moseying over a long dusty trail can cause a rider to build up a hearty appetite, for several years: "Ms. Hadie Hawkins served lunch in little cardboard boxes: a piece of chicken, tater, biscuit and BYOB." And if one can't comfortably straddle a saddle, they can hitch a buggy or wagon up to their favorite mule, horse, donkey or pony. Fast forward to the present with current Cannon County Walking Horse Association President Benny Lance: "I'd like to take a moment to reflect on all the work that has gone into this great book," with a goal to "put down some history of this Association and what a wonderful part it has played in so many lives down through the years." Former leaders of the Association had a vision to the future. "They knew that someday the 'road riding' (on public roads) would come to an end," Lance trailed back in time. Lance rode his information steed into the present-era: "As it is today, the CCWHA owns over 400 acres. To everyone who owns a horse, whether you own hundreds of acres or one acre, or whether you rent a horse, all you have to do is buy a membership with CCWHA and you are part owners in over 400 acres to ride on." How popular does The Ride remain today? "Last year, we had 1,011 riders, a record high turnout," accounted Patricia, wife to President Lance. "During the past four years, The Ride is averaging more than 725 riders per year." Mrs. Lance provided a unique description of the motivation to take on "The Ride" book project: "This book started as a wonder why, then turned into a wonder why we don't, then turned into why don't we." Woodbury Dr. Trea Wessel shares the (actual) Ride experience each year with her family, including EMT husband Jason Barrett and children Courtney, 20, Emma, 8 and Eli, 6. "It's a great tradition," diagnosed Dr.Wessel. "We've been to similar events in other states, but the Cannon County Ride is made up of great neighbors. I've been riding here for 14 years. My husband has been on the trail now for 25 years or more." Trail-riding attire has changed significantly from the 1940s to the present. "When we think of riders today, the clothing that comes to mind is the cowboy hat or ball cap, blue jeans (some bought with holes in them) and cowboy boots," the book accounts. "However, that was not the case in the 1940s. Attire in general was more formal, and that was often the case depending on who drove or rode horses. Jerry Higgins recalls his father, Dave, driving his buggy wearing his blue suit. "Men on horseback, particularly middle-aged men might wear a Fedora hat, a suit with white shirt and tie, and polished dress shoes," The Ride book chronicles. Cannon County native Bobby Womack recalls going on "The Ride" as a teen-aged boy. "There were just a few of us boys on The Ride one year," Womack walked back in time. "But in subsequent years, The Ride got rejuvenated when some prominent retired families got involved." Cannon resident Christine Dillon describes The Ride's impact on her life: "My family's involvement with horses goes on and on. When young, my mother, carrying her son, my half-brother Stanton Tenpenny, rode a horse to Geedeville to teach school. My aunt had a solid black horse named 'Tar Baby'. In later years, I rode a lot with (the late) Bill Smith on The Ride." In The Ride book, Shane Gannon shared: "Grandfather Hilder Gannon was a horseman. He had as deep an appreciation and understanding of horses as anyone I've ever seen. Horses and mules were used by many people in this part of the country to help make a living. They were used for plowing fields, taking grain to the mills to have flour made, logging and clearing land, or maybe just going to town and church." Rider Anna Nichols penned: "Camping on Short Mountain is different than camping anywhere else in the world. Meeting new people and making friends that last a lifetime, that's camping on the Mountain."